estos uaCSTA Server for SIP Phones is a CSTA middleware for SIP telephones capable of uaCSTA. The solution consists of uaCSTA Server for SIP Phones and ECSTA for SIP Phones. They permit control and monitoring of telephones from applications compatible with Microsoft® TAPI. uaCSTA Server for SIP Phones provides controllable telephone resources to registered clients. 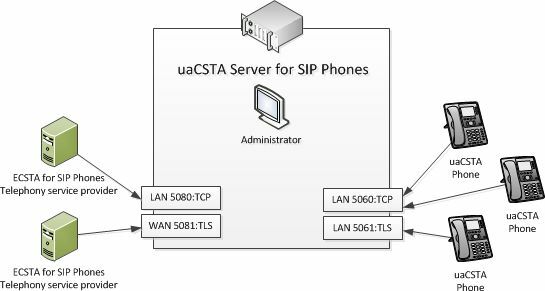 uaCSTA Server for SIP Phones is thereby the central binding element between all participating components. ECSTA for SIP Phones is a telephony service provider for Tapi 2.1 (and 2.2 & 3.0). Conceptually, the uaCSTA Server for SIP Phones is a registrar and a proxy. All components with would like to exchange telephony information must log on to the registrar. As a proxy, it can transfer information given a separated network infrastructure (its own network for telephony, VLAN or physically separated). The default SIP and CSTA protocols as well as through certificate-based TLS, permit secure standardized communications between all participating components. As a telephony service provider (TSP), ECSTA for SIP Phones provides a TAPI conforming to standards. The driver will be used in connection with applications using TAPI (UCServer, ProCall and other TAPI applications). uaCSTA Server for SIP Phones and ECSTA for SIP Phones are provided as an MSI installer and can be used in the current 32 and 64 bit Windows® operating systems. Both components can be installed on one and the same machine.